The Environmental Study Report (ESR) was completed and placed on the public record for a 30-day review which ended on Friday, August 3, 2018. Municipal infrastructure projects are subject to the requirements under the Environmental Assessment Act (EAA). The Municipal Engineers Association Municipal Class Environmental Assessment process is a streamlined planning process, approved under the EAA. This study is being carried out as a Schedule C activity under this streamlined planning process. Located in the north-east part of Scarborough, Passmore Avenue is an east-west collector road in a mixed commercial/industrial area, with a 60 kilometre per hour (km/hr) operating speed. The study area for this environmental assessment is bounded by Middlefield Road to the west, Markham Road to the east, McNicoll Avenue to the south and Steeles Avenue East to the north. Passmore Avenue, west from the project focus area to Middlefield Road, was widened to four lanes in 1989. The project focus area, from the Markham Road intersection to approximately 450 m west, is a two lane rural road and is identified in the Official Plan to require a 27 m right-of-way. 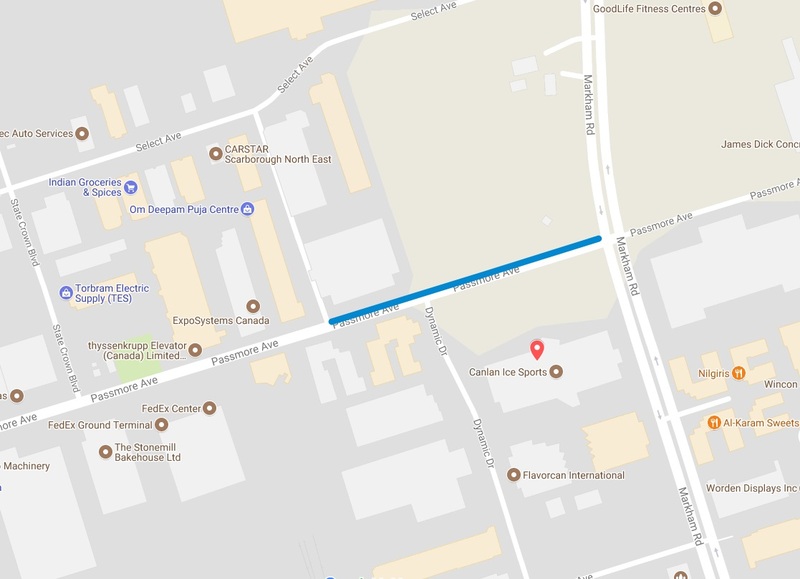 In conjunction with necessary resurfacing work, there is an opportunity to widen this approximately 450 m segment and, in the context of future developments, extend stormwater and sanitary sewer infrastructure from Markham Road, west of Dynamic Drive, to the existing stormwater and sanitary sewer lines.